Perri's Leathers introduces its new ranges of licensed straps and picks featuring iconic bands Nirvana, KISS, Soundgarden and The Doors. 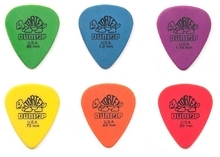 Pykmax, the new ergonomic guitar pick, is now available for purchase in Europe via eBay UK. What if you could finally get rid of those picks that slip through your fingers and get lost all the time? Then have a look at Pykmax. D'Addario has partnered with Planet Waves in order to launch the Build A Pick website where you can buy customizes guitar picks. Dunlop has added a new signature Jazz III pick for Dream Theater guitarist John Petrucci. D’Addario and Planet Waves launch the online Build a Pick Program for artists and retailers to create their own picks. Planet Waves announces its new twist on celluloid picks, Cellu-Glo. This 5.85mm pick is described as a cross of the Nexus and the Psycho Shredder.